Your resource for all things shoegaze and dream pop: WTSH's Best Tracks of 2015 show (part 2) now available to stream via Mixcloud + set list. 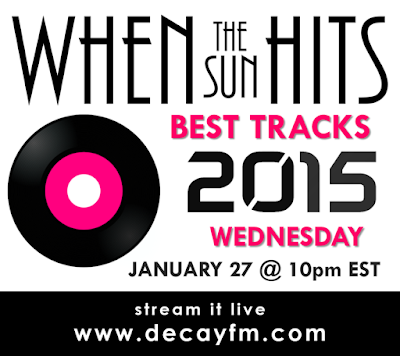 WTSH's Best Tracks of 2015 show (part 2) now available to stream via Mixcloud + set list. Schonwald – Lux. Between Parallel Lights. Title Fight – Chlorine. Hyperview. Spectres – Where Flies Sleep. Dying. Future – Try It. Horizons. Wildhoney – Fall In. Sleep Through It. Tender Age – Get High. Get High/Always 7”. Flavor Crystals – Mirror In My Mind. The Shiver of the Flavor Crystals. Static Daydream – When She Falls. Static Daydream. Them Are Us Too – Us Now. Remain. Drab Majesty – Unknown To The I. Careless. Venera 4 – 3 Studies For A Portrait. Eidolon. The Black Ryders – Seventh Moon. The Door Behind The Door. Classic Tracks Archive: Medicine || The Pink. Remake: Dum Dum Girls x Medicine || Lord Knows. Bandcamp Track of the Day: Astrobrite || Heaven. New Track: The KVB || In Deep. New Video: Force Publique || Hopeless. New Video: Bloody Knives || Reflection Lies.